Chunky Stretchy bracelet! Made with ivory and pale pink pearl chunky beads, stardust gold chunky beads and pale light pink & iridescent gold rhinestone sparkly chunky beads. The spacer beads are gold tone. Child Size best for ages 5-9. I do my best to triple check that every item is sealed and secured. 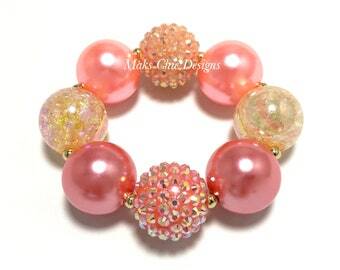 These chunky beaded bracelet are considered a choking and strangulation hazard to children under the age of 3. Young children should not be left unattended while wearing this item. Its best to keep necklaces/bracelets free from water or harsh chemicals. It may fade over time is not cared for.